The house I am currently living in is rather expensive to keep warm enough for my taste so I have been looking for other ways to help warm the house a little cheaper. I came across this terra cotta pot heater and figured I would give it a try. It is really easy to put together and not so expensive that it is money wasted if it doesn’t do much. What you need to build the heater I made is: three terra cotta pots in three different sizes (not too big), a candle in a glass jar, a bolt about six inches long, nuts to fit the bolt, washers that are bigger than the holes in the pots but smaller than the nuts, and bricks or something to prop up the pots. I will attempt to explain how to put it together, but here is a site with a great cutaway view of the heater. Take the large pot and put a washer on the outside of the bottom of the pot and thread the bolt through so that all the length is on the inside. Turn the pot right side up and put another washer on the bolt. Follow with a nut, another washer, and then the next smaller pot. Repeat these steps for the smallest pot. The picture to the left is what mine looked like when it was done. Then we arranged the pots on the bricks over the candle like in the picture above. Light the candle and wait for the heat! It has been about an hour and it is starting to get warm. It seems that while it may help keep the room a little warmer, it likely wouldn’t warm a house very well. Please visit my new blog at homesteadhouligan.com! Just an an observation. This device would work 30 times better is used over the top of a kerosene lamp (lighting source) as the heat from a lamp is much hotter. So you light your room as well as get some free heating! And it would also trap the soot from the lamp to keep the room cleaner. Two for one is always better in the bush (an Australian term for country living). The other thing you can make is a fat/oil lamp for lighting and it would also heat the pot heater better as well, perhaps even enough to heat a kettle of water if the top of the earth pots are flat enough. Every BTU saved and reused is a bonus. So you get 4 for one, Recycle used oil/fat, free light, free room heating and free water heating! Well 5 for one if you include the soot trapping ability of the pots. I will have to give some of this a try! Mine never really got too hot. I think I need to work a bit on the design if yours got hot enough to to burn everything! 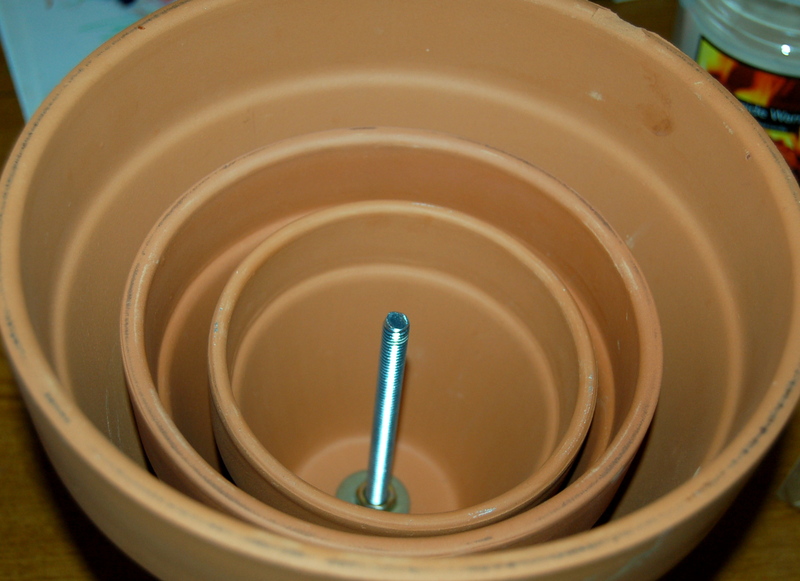 It works well to use two pots, the inner pot has the hole in the top closed. The heat warms it and warm air flows out of the bottom once it gets warm enough, radiant head from it also heats the outer pot and the warm air comes out of the hole in the larger pot on top. In reality, it’s not all that efficient but in a small room it would be fine if you didn’t want to use a space heater. http://www.amazon.com/s/?ie=UTF8&keywords=chimney+balloon&tag=googhydr-20&index=aps&hvadid=4230240189&hvpos=1t1&hvexid=&hvnetw=g&hvrand=11621640201437528765&hvpone=&hvptwo=&hvqmt=b&hvdev=c&ref=pd_sl_54pyl1k7eq_b You might think of putting one of these in your chimney. Interesting. Luckily we don’t live in that house anymore. Why do you have to use such a long bolt? The bolt goes through all of the pots and has quite a few washers and nuts in between. Ours was actually a little short. This idea is O.K. but look at the reality. You can buy propane tanks that will burn for 8 hours and trough a hell of a lot more heat for $3.00 a each. Or you can can buy a dual burners that hooks to a large propane tank. If you’re concerned about carbon monoxide all you have to do is place it on your oven door and it will be ventilated while heating your kitchen and livingroom for the entire day…real heat. I have myself set up like that and I am also in process of purchasing a 7000 watt continuous generator with 8350 surge watt. It will run at 50% which is all you need to power your entire house including heat if you have gas. I’m using switchgear so that if we have an outage I just flip a switch, go out to the garage push a button because it’s electric start and I’m powering my whole house 1 freezer 2 refrigerators my lighting cable stove is gas washer dryer and outside lights. It’s quiet and I run it in the garage with the door slightly cracked for ventilation. If you can afford it make it easy on yourself! I also have a small backup 2 stroke generator and solar. I was going to go the solar route but it’s way too costly and not reliable. By the time you get enough solar collectors batteries and power inverters you’ll easily be into $10,000.00 with no guarantee that you’ll get enough to power your entire home. I’ve use my small generator and watched tv and used an electric blanket. I have one advantage I live in Texas so it really doesn’t get that cold. The heat is easy to deal with even with A/C a couple of fans can do the trick for that. My large generator will power my A/C also. So for under $6000.00 I can reliably power my entire house less the fuel and maintenance. For most of us that’s a lot of money but you just have to save up. I also have numerous solar lamps that can go for 12 hours and throw a lot of light and they’re cheap. This had been a setup that someone had suggested to me. We no longer have this old fireplace, but a wood stove instead. Our plan this year is to build s glorified version of this heater, this version was minimally useful. We plan to stack fire brick around the wood stove to function as mass to absorb and then give off heat as the stove burns down. Similar to the terra cotta pot heater, but bigger and more functional. I saw a question about why the bolt is so long, and wanted to chime in. The bolt is important because it will sit just above the flame and act as a conduit for the heat. The pots will trap rising heat from the candle, but if the bolt is actually long enough to be close to the flame the metal will heat up, and the heat will travel to the washers and nuts to help add more heat to the unit. I used 4 pots instead of 3. With a 4″ x1/4″ bolt. I also wrapped the outside of two inner pots in Comercial heavy duty foil and secured the foil using metal duckting tape ( the heat actually welds the tape adhesive to the foil) I wrapped the first and last inner pots. I also used a small stepping stone for the bottom of the heater with a doily made from foil just slightly larger than my heating source. This actually heated both rooms (30×15 patio conversion) to the point that my son got up in the middle of the night and blew out the candles.